Our recent City Space Race report highlights a dilemma that most growing cities are currently facing: they need to build more houses and offices, but regulations and local political pressures restrict them from expanding (particularly when it comes to green belt development). In theory, there is a simple way for cities to have their cake and eat it too. 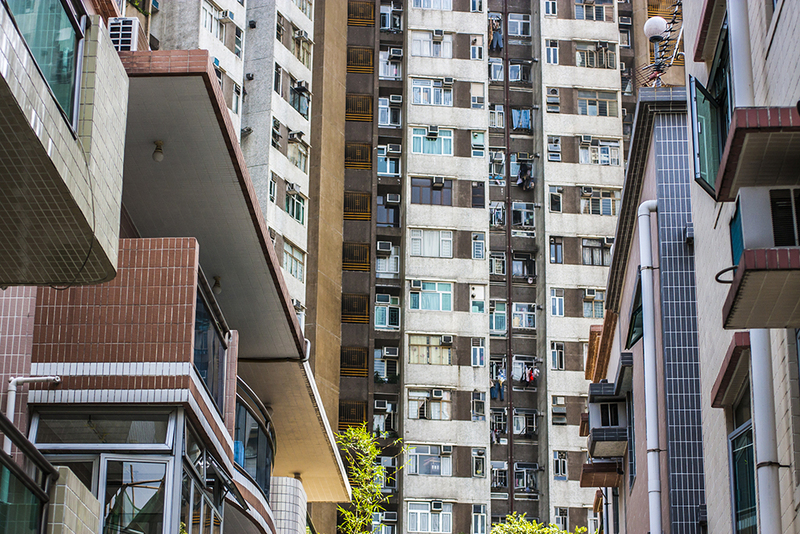 Increasing density — allowing taller buildings on the same space — should enable cities to provide more property space without having to expand outwards. This idea is often the source of heated debate in public discussions about tackling the housing crisis in our most economically vibrant cities. But is increasing density the right solution for cities with high demand for land – and how viable is it in practice? The UK is already a dense country. It has one of the highest average built-up densities — the population density of inhabited areas — across European countries. But average national density is a blunt measurement of population versus land in a country and offers little insight into the variations across and within cities. When we look closer at UK cities, it’s clear that few urban neighbourhoods have the level of density found in other European cities. The densest square kilometre in the country, with a population of 20,000, is in the London neighbourhood of Maida Vale — an affluent area which doesn’t exactly fit the stereotype of an urban jungle. In contrast, some urban areas on the continent exceed 50,000 inhabitants — for instance, the most populated square kilometre in Europe is in Barcelona with 53,000 inhabitants. The chart below plots all square kilometre units that are populated with more than 10,000 inhabitants for a selection of countries. In the UK, 86 per cent of these areas have between 10,000 and 15,000 inhabitants, and the other 18 per cent have less than 20,000. 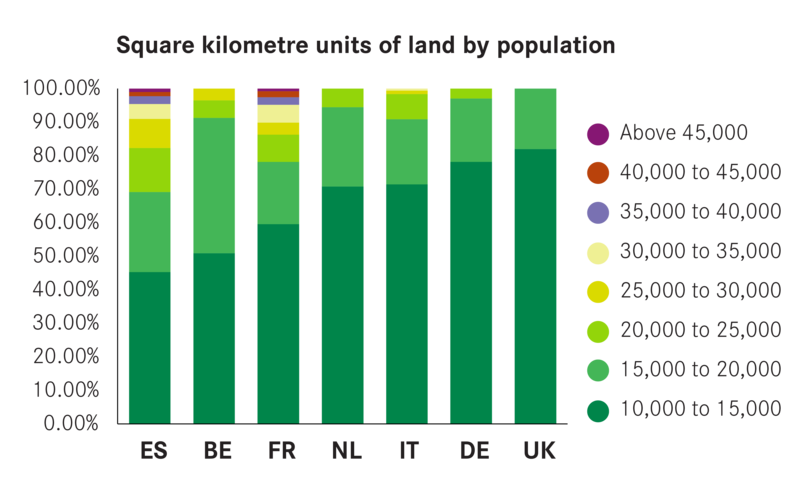 In comparison, all other main European countries have areas exceeding 20,000 inhabitants, with Italy, France and Spain having a considerable share of very high-density neighbourhoods. This means there is scope to increase density in UK cities, and in particular in residential neighbourhoods. This would have many benefits: not only would it allow cities to accommodate new residents without expanding, it would also improve cities’ transport accessibility and planning. Let’s focus on this last point. Transport systems in denser cities are likely to be more efficient because they can reach a larger share of the population at lower costs. Consider Hong Kong, an extreme case of dense population settlement. Only 7 per cent of the working population commutes using their private car according to the Hong Kong statistics department. In contrast, 33 per cent of Londoners travel to work by car (still a reasonable figure against international standards), while this group is bigger still in Liverpool (57 per cent of commuters ) in Manchester and Birmingham (64 per cent), as shown on our data tool. High density in Hong Kong makes the transport network more efficient too: the metro network is short in length (210 km), and yet it serves 1.1 million workers every day. In comparison, “only” 800,000 commuters use the London Underground (according to the 2011 census), despite the network being twice as long (402 km). In other words, denser cities lead to better transport accessibility, and this, in turn, means better access to jobs, less traffic congestion and fewer carbon emissions (as research by LSE cities shows, there is a clear negative correlation between urban population density and carbon emission per capita). As such, increasing population density clearly brings significant advantages. However, it is not easy to achieve, and there are two main reasons for this. First, some local residents are concerned that densification will alter and threaten the nature and shape of their city, and this puts political pressure on councils not to act. That’s because densification is often amalgamated with high-rise buildings. But London does not have to become Hong Kong. If only 5 per cent of the capital’s built up area had the density of Maida Vale, it could host an additional 1.2 million people, without the need to expand outwards. Second, it is easy to forget the administrative and technical complexities of densification. In concrete terms — both literally and figuratively — densification means knocking down existing buildings to build new ones. This is time-consuming and it has a cost. Moreover, unless a city has in place an overarching plan to increase densification across its length and breadth, it will take decades for it to become more compact. For growing cities to build more houses and commercial space, there are only two options: build up or build out. Building up (densification) has many great benefits, but it is also difficult to deliver. To have a chance to happen, densification must be at the core of strategic planning policies and cities must have the necessary power, determination and leadership to bring it about. However, this is a long-term strategy, with benefits that will only be reaped in the long-term. In the meantime, a number of cities have an urgent need to build more houses, and lack of action puts pressure on the existing stock, as highlighted in our report. Only building out (expanding) will enable them to respond to this need quickly enough. In most cases, this means that some green belt land must be released for development. This is a difficult trade-off, but there is a middle ground between full densification and full expansion. For instance, cities could release plots of green belt land that are found within walking distance to an existing train station, and ensure that new developments have higher densities (in a Maida Vale rather than a Hong Kong style). This would allow cities to create a large number of homes on a small fraction of the land, limiting encroachment on the green belt and allowing easy transport access to the city. In the coming months, we will be doing more work on how national and local leaders can get this balance right in cities across the country – watch this space for more details. It would be interesting to see some further analysis of the ability of densification to meet short term housing needs based on brown field land statistics. Even if performed for just a few cities (perhaps those who arguably most need to utilise greenbelt land).